Burns Night is fast approaching. Are you planning to throw a Burns Supper for your friends and family this year? 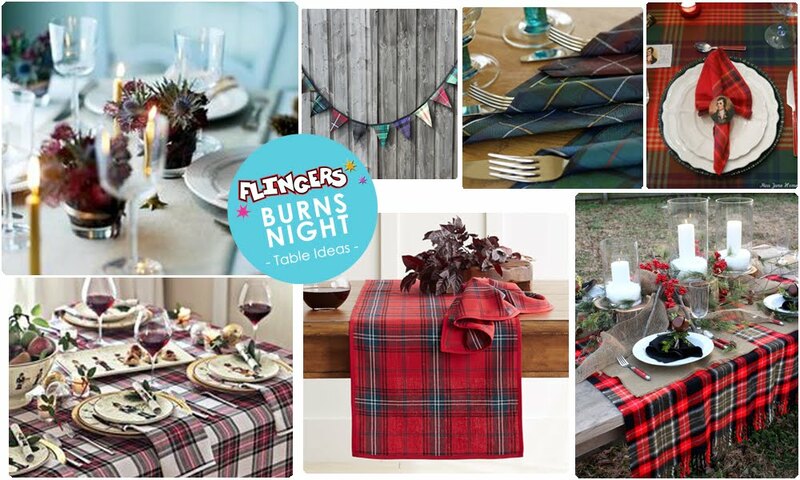 Earlier in the week, we put together our top 5 tips on how to plan your Burns Night party. So now, we thought we would share with you some stylish ideas on setting your table for the big night. First of all, you need to decide on your main theme, which will lead you to your colour scheme for all your party decorations and table ware. You can focus on the red and yellow of the Royal Standard of Scotland flag, or go for the simple blue and white of the more common St Andrew's Cross Scottish flag. But we've decided to focus upon stylish tartans. It's the best way to capture a little bit of traditional Scottish heritage and history, very apt for Burns Night! You could even track down your own family tartan to decide which style and colour-way you want to follow when setting your table. Tartan is great way to set a stylish theme for your evening, from the tablecloth down to the napkins! Fill your table with displays of fresh bunches of thistles and greenery and set the mood with lots of candles too. Reading Robert Burn's poetry by candle light after a hearty dinner, what could beat that for a successful Burns Supper? Burns Night falls on Monday 25th January this year, are you doing anything to celebrate? Remember to check out top tips on planning your evening!